Four days left in our second 100-day sprint. We set the goal of housing 189 veterans experiencing homelessness, of which 75 were chronically homeless, of while 25 were currently unsheltered. How did we do in reaching our numbers goal?!?!?! As the numbers roll in, we are getting so close. We will probably reach our chronic goal but be just shy of our overall goal and unsheltered goal. But honestly, the progress on the SYSTEM is not captured in these numbers and will continue. Is there still work to be done? Absolutely! Are you going to do a third 100-day goal? Absolutely! The Philly Vets Home team was honored to attend the 25 Cities Launch and is currently in a 45-day planning phase for a community launch on a coordinated assessment and housing placement system in June. We are also aligning with three counties surrounding Philadelphia who launched their own DIY Boot Camp. 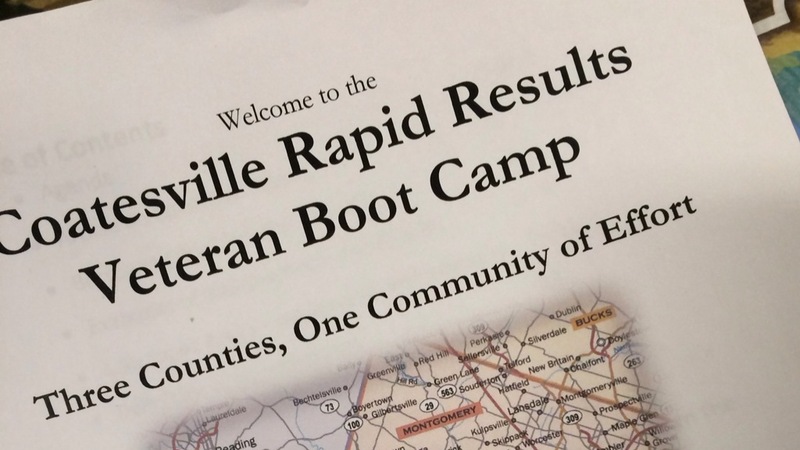 The Philly facilitator worked with the Coatesville VAMC and local SSVF grantee to lead the Coatesville Boot Camp. Of course the work continues. But there are new procedures and policies locked in place as we ratchet up our ability to END Veteran homelessness in Philadelphia.